If you require advice regarding a spinal injury contact: FOR CERVICAL SPINE - neurosurgical SpR on call. FOR THORACOLUMBAR - orthopaedic SpR on call. For consultant input contact the SPINAL CONSULTANT ON CALL via LGI switchboard. if there is a neurological injury then inform Spinal Cord Injury Centre within 4 hours (0844 811 8110). This is the responsibility of the Trauma Unit team. Ask to speak to the consultant on call for spinal injuries. 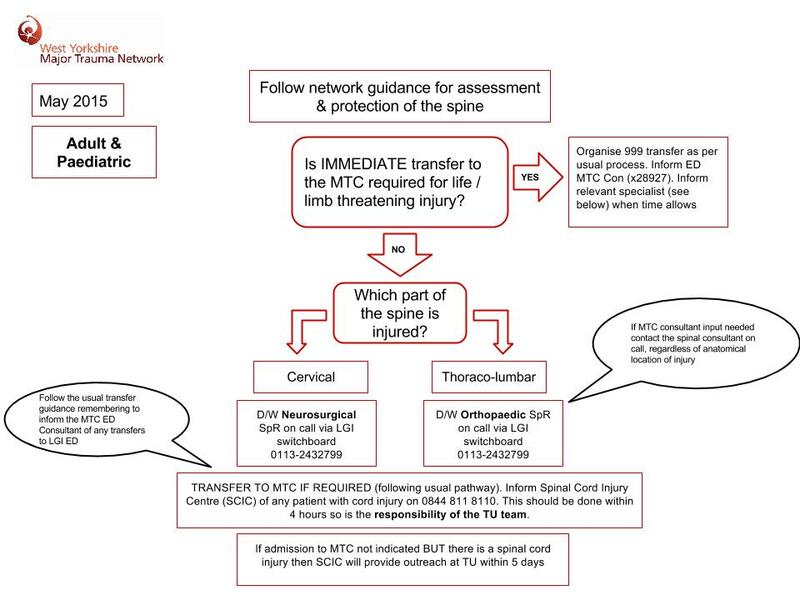 If, following discussion with the MTC spinal team the patient needs secondary transfer to the MTC then admit to TU and follow secondary transfer guidance. If the patient does not need transfer to the MTC (eg isolated cord injury with no requirement for spinal surgical input) then admit to your TU. The SCIC will provide outreach visits within 5 days and then weekly until transfer. If admission to SCIC not appropriate then patient should remain at their TU and SCIC will continue outreach there.